Edinburgh need to learn to embrace "big moments", said head coach Richard Cockerill after their Champions Cup quarter-final defeat by Munster. Despite dominating possession, territory, and holding a 13-10 lead with fewer than 20 minutes to play, Edinburgh succumbed to a late try. Keith Earls went over in the corner to ensure Munster clinched a 17-13 win. "There were fine margins," Cockerill said. "In the big moments, you have to take your chances and be composed." 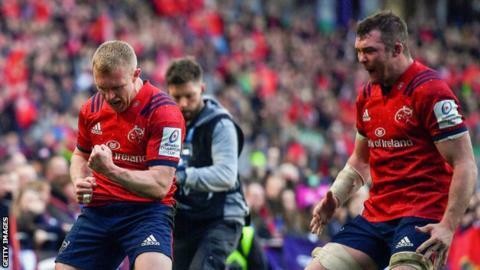 Before Earls' winning try, Edinburgh were awarded a penalty for a late tackle on Jaco van der Walt, but the decision was reversed after prop Pierre Schoeman barged Munster's Tadgh Beirne in the aftermath. From there, Munster kicked into Edinburgh territory and, swiftly after, Ireland winger Earls touched down for his second of the match. The Irish side also won several turnovers on their own line as Edinburgh threatened to break through, but ultimately Chris Dean's first-half score was the only occasion they breached Munster's defence. "We probably played more rugby than they did," Cockerill said. "We had opportunities in the first half to take points but our kickers weren't comfortable, so we went to the corners, we had opportunities." "You can't give a silly penalty away, you can't be off your feet on their goal-line and they poach the ball. All those tiny, tiny little bits. You have to learn, and you only learn by doing it." The match was only Edinburgh's third appearance in the knockout stages of Europe's premier competition, in which they were playing for the first time in five years. Last season, the club reached the Pro14 play-offs for the first time under Cockerill's guidance, and are still in contention to repeat the feat with three regular season games left to play. And despite professing himself "cheesed off" in defeat, the Englishman insists the club remains on an upward curve. "No team develops from where we've come in two years to be the best in Europe or the Pro14. It takes time," he said. "We're building, we have a plan, every year we've got to get better. And we need to start to join all that together in terms of the league, Europe and compete on two fronts better. "We're a good team, we've done some great things but we just need to do it better."